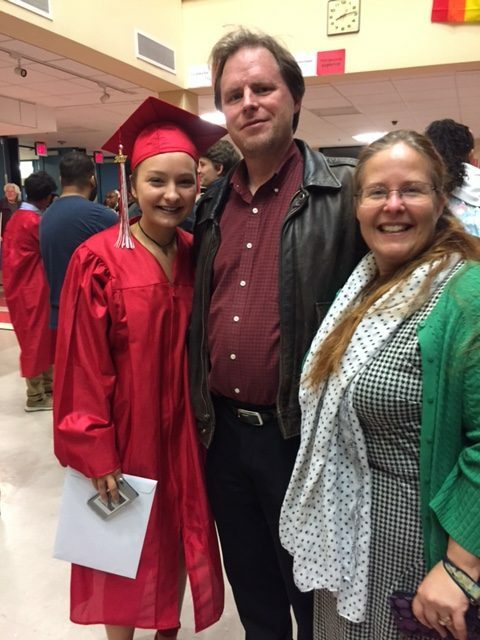 The Salem-Ota Cultural Exchange is pleased to announce that Sophie Parr, a graduating senior at Salem High School has been awarded this year’s Scholarship award, presented during the Salem High School Senior Awards Night. She will be using this scholarship as she attends the Massachusetts College of Liberal Arts this fall. She, and the other applicants for the award, were asked to write an essay about their involvement with the exchange; how it affected their life; and how it will influence their future. My family has participated in the Salem-Ota Home Exchange as a Host family several times over the years. Though all experiences have been educational, rewarding, and full of excitement; one student, Kouya, has become a special part of our family. He was the very first exchange student that we had, back in the summer of 2009. When Kouya first stayed with us, we were very new to the whole program:-Kouya and my oldest brother, Will were about the same age. They bonded immediately and Kouya became another brother to me and all of my siblings. Offering up your home for a whole entire week is quite a commitment but also an enormous honor. The program is amazingly welcoming, with some of the most kind-hearted people in the city of Salem. The Cultural Exchange has had a huge impact on my life. Starting from a very young age, I was introduced to a completely new and exciting culture. I was able to make friends with students that live all the way across the world, while meeting other families within Salem. This was the beginning of my indescribable love for traveling, experiencing new ways of life, trying new foods, and meeting new people. The weeks spent with the Salem-Ota exchange are incredible memories that my family and I will cherish forever. Just this past March, Kouya, the very first student we ever had stay with us, came back to America to visit again. For ten days, we were able to reconnect, reminisce, laugh, and share our current lives with each other. Kouya’s English improved a lot over the years . He is no longer a quiet junior-higher student, but a young man exploring the world, studying in college, spending time with his friends, and so much more. He was able to speak with us a lot more. When he stayed with us in 2009, he really wanted to tell us about what Christmas is like in Japan, but he didn’t have the proper English skills to do so. Many years later, on his last evening in Salem, he was able to tell us all about Christmas, as well as other holidays that they celebrate. We told him all about our Christmas, Easter, and Thanksgiving. These ten days were such an eye-opening experience for me. I am about to take my first steps out into the real world, to go to college. Next week, I will take my first trip out of the United States to visit Madrid, Spain, where I will learn all about the culture of the beautiful European country. The Salem-Ota exchange, and my relationship with the newest member of my family, will influence my future in every way. One day, I will make it to Japan to visit Kouya and see his way of life there. I will always have a special connection to our sister city, Ota. Being a part of a Host family for the Salem-Ota Exchange has shaped my life, as well as my families, in so many beautiful ways.